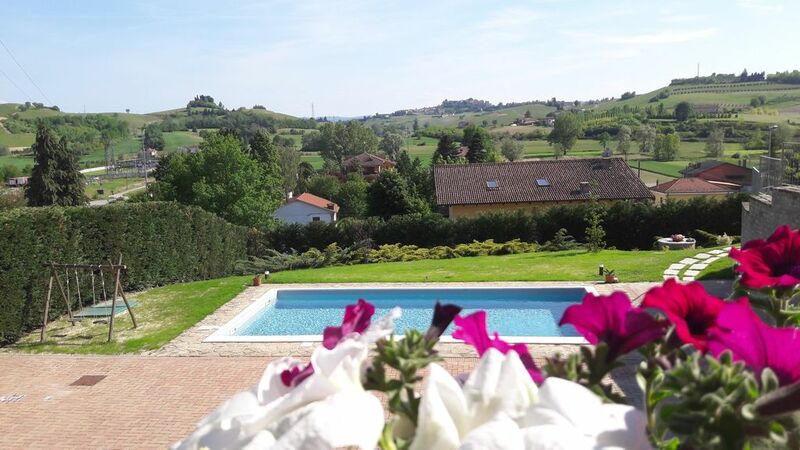 Villa Sofia offers guests a large terrace overlooking the hills of Monferrato and the view of the garden and the pool with the possibility to eat outside with barbecue, sun beds to relax in the sun or in the shade. The accommodation offers 5 beds, ideal for a family with 3 small children in fact has a kitchen, bathroom and a bedroom for 4 people plus a cot. In the area you can visit places rich in culture and gastronomy and organize excursions on foot or by bike. The area is renowned for the production of great wines such as Babera, Brachetto, Moscato, ASTI Spumante, Prosecco, Barolo and Barbaresco. The quality of Piedmont IGP hazelnuts is also appreciated. Among the places to visit there is Alba. ASTI, Canelli, Acqui Terme, Barolo and Barbaresco. The Piedmont holiday between Langhe, Roero and Monferrato offers a feeling of tranquility and beauty. The landscapes are different: La Langa del Barolo and the hills of Barbaresco on the one hand, Monferrato and Barbera on the other. Canelli and the ASti Spumante and the Monferrato dei infernot with Monte Cella, Ozzano Monferrato, Ottiglio, Vaglio Serra. Also 12 km is Santo Santoffino Belbo, the birthplace of Cesare Pavese, who with his poetry depicts the hills and hills of Langhe. Within walking distance you will find an excellent spa with a spa where you can spend a relaxing day.